But...there are 9 ways of not being able to jump at them! 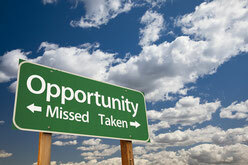 The definition of an opportunity is quite simple. It appears within a "window" of time. Once this window is closed, the opportunity is gone. No more! I have missed some opportunities in my life and I guess you have done the same.